If we’d known how interesting the radio scene in St. Cloud, Minnesota is, we might not have saved it for the last few hours of Big Trip 2013. But we didn’t – and so we came flying down I-94 from Fargo-Moorhead pretty late on a Friday afternoon with a flight to catch the next midday out of Minneapolis-St. Paul. Luckily for us, we had a top-notch local guide in the person of engineer Alex Hartman, and even luckier for us, early August in the North County features some delightfully late sunsets, which meant we could see nearly all of the market in the lingering hours of dusk, with just a few towers to pick up on the way out of town the next morning. There wasn’t much question what our first stop would be – we pulled in to town just a few months after one of Alex’s clients, veteran broadcaster Herb Hoppe, had finished construction on one of the most remarkable AM sites anywhere in America. 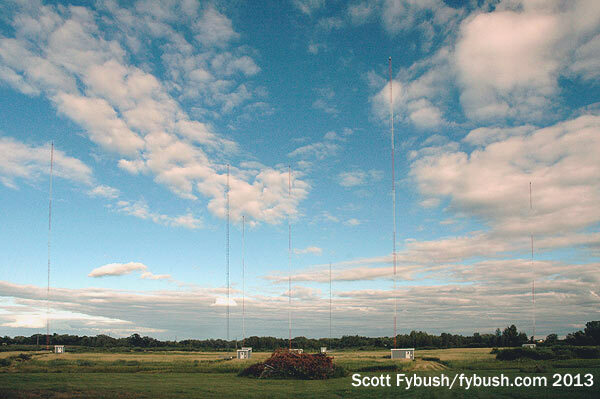 Just across the river in Sauk Rapids, Hoppe has quietly assembled a cluster that includes one FM (WHMH-FM 101.7) and no fewer than four AM signals, all of them sharing a single seven-tower site just off US 10. 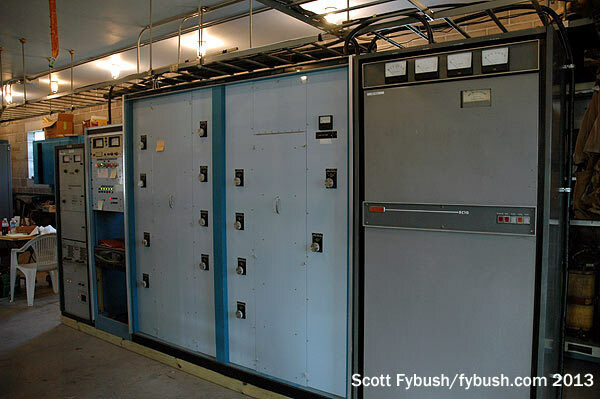 The “quadplex” started out as just one station, 250-watt non-directional daytimer WVAL (800), but over the years WVAL shifted to 660 and eventual full-power operation (with a big 10 kW daytime signal from four towers). 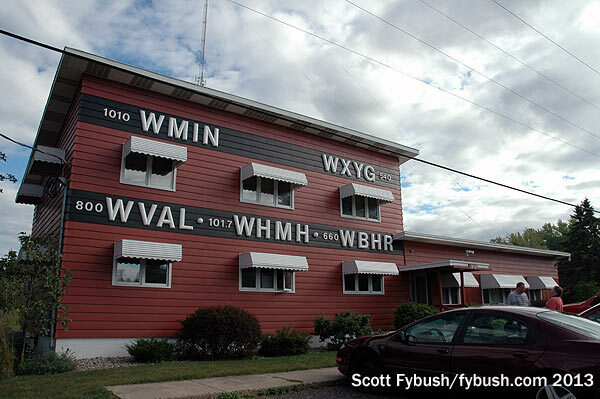 The 660 signal became sports WBHR (“the Bear”) and then spawned a new incarnation of WVAL back on 800 – and then Hoppe’s son Gary added two more AMs much later in the game, WMIN (1010) and WXYG (540), with three more towers added to 660’s original four! 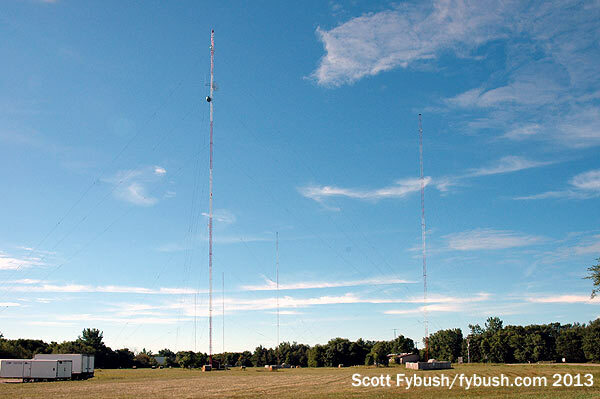 The quadplex site, just a short drive from Hoppe’s Sauk Rapids studios (we’ll see those in a bit), started out as just 660 when it went to higher power, but with the help of consultants Mark Mueller and Mark Persons, it’s become something much more complex and – we’ll say it – beautiful. 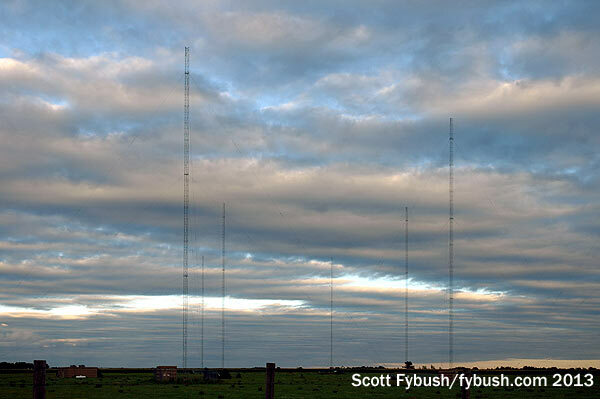 Each of these four AMs is a DA-2, so over the course of 24 hours there are eight patterns that emanate from these towers, with all the added complication of reject filtering and bandwidth that can make just a simple diplex a nightmare, never mind four stations at once. 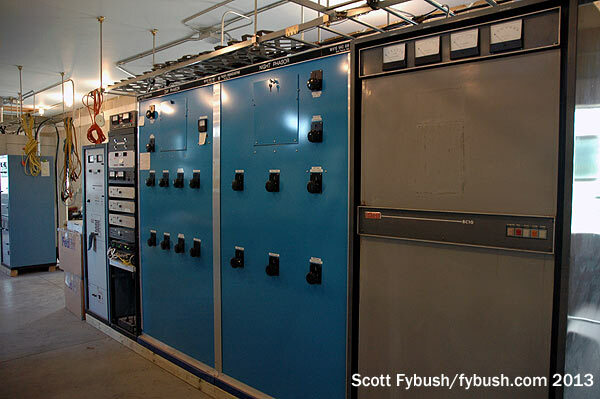 Inside, the new transmitter building at the site had been under construction the last time our traveling companion Garrett Wollman was here a few years earlier. 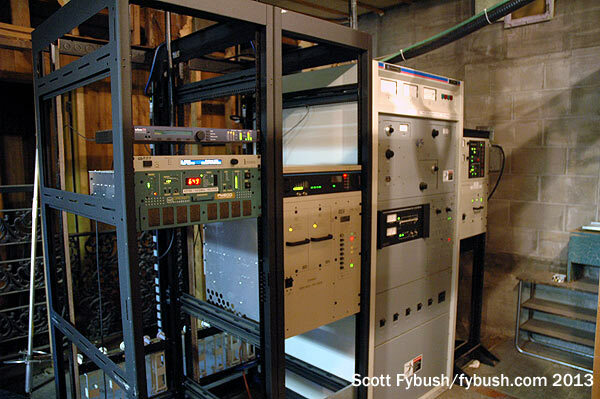 By the summer of 2013, it was finished, and it was neat as a pin, with each station getting one corner of the building for its own individual combination of main and aux transmitter, STL and phasor. 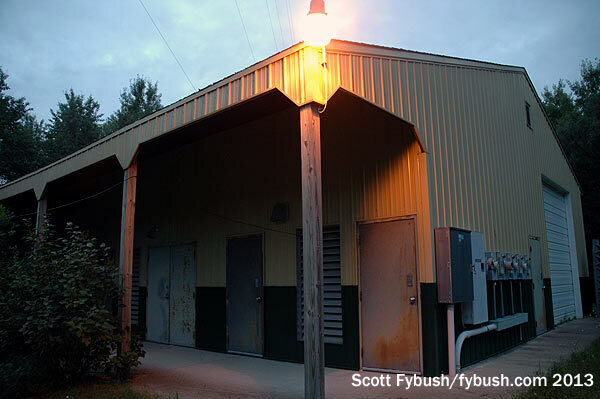 Out back, neatly mowed paths through the reeds go back to the towers, which boast enormous numbers of the door of each ATU building for easy identification of which stick is which. (I’m told this bit of detail seriously impressed a visiting FCC inspector, as well it should have!) 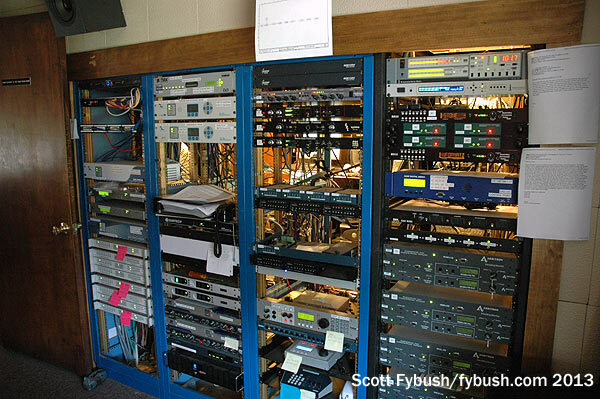 The combining and filtering takes place inside each ATU building, and you can read Mark’s article in Radio World for more detail on how the magic happens. How impressive is this site? So much so that it was a no-brainer to pick it as the “cover girl” for Tower Site Calendar 2015, still available from a Fybush Store near you. 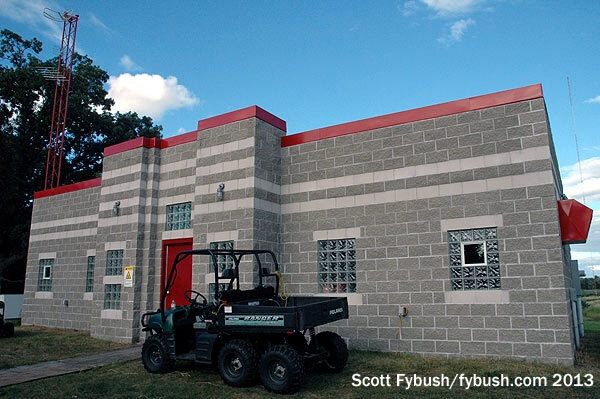 Hoppe’s studios are in the “Big Red House” just outside downtown Sauk Rapids. 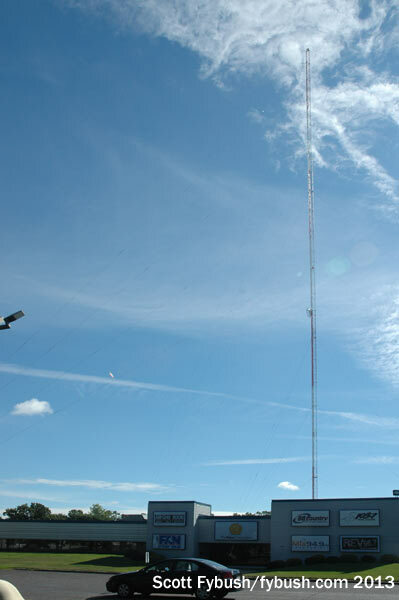 This was the original WVAL (800) studio and transmitter site, and the tower out back was later WHMH’s site before it upgraded to a C2 from south of town. 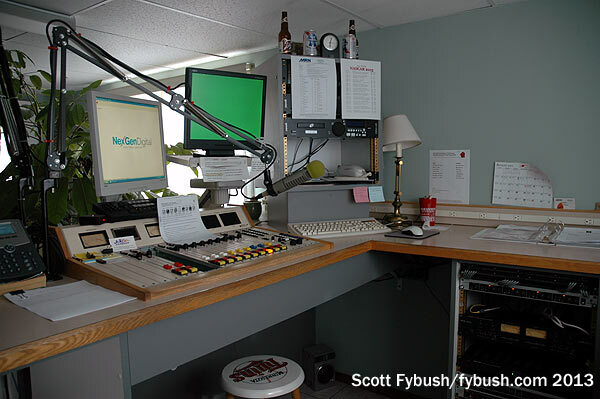 Inside the Red House, there are studios off to the right of the door (modern rock WHMH and classic country WVAL have the most air talent; WBHR is largely ESPN Radio, and standards WMIN “Uptown 1010” and classic rock WXYG “540 the Goat” are automated) and offices to the left; directly in front is the rack room where Alex has rigged up all that automation to keep the five-station cluster humming. 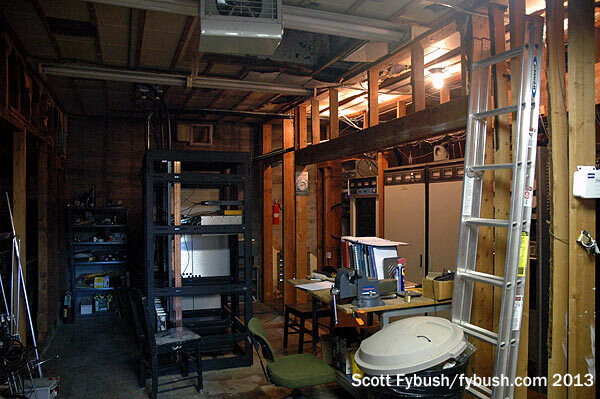 Upstairs, there’s more studio space, including an attic area where the stations keep their remote gear tested and running for the live sports WBHR and WVAL do. 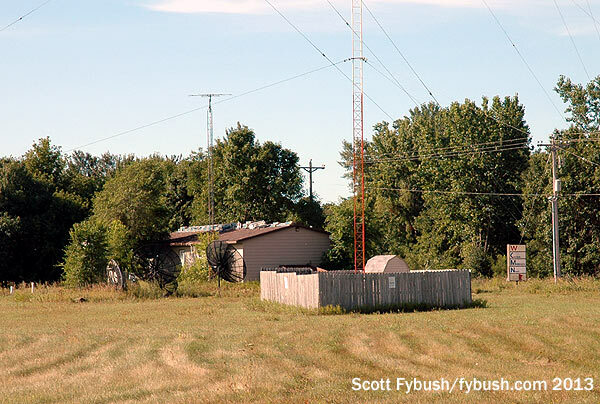 Heading back into town, we next turn our attention to the stations of Leighton Broadcasting, whose holdings here include KNSI (1450), KCML (99.9), KZPK (98.9) and KCLD-FM (104.7). 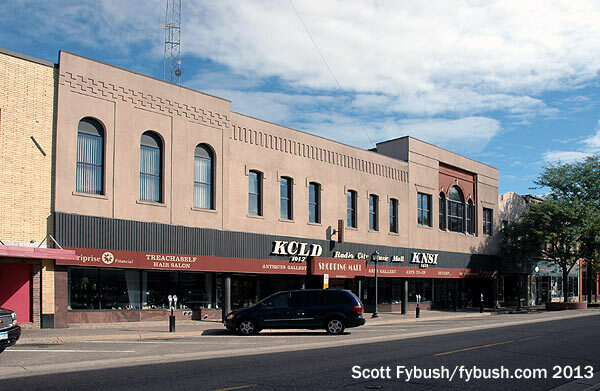 The Leighton studios are right in the heart of downtown St. 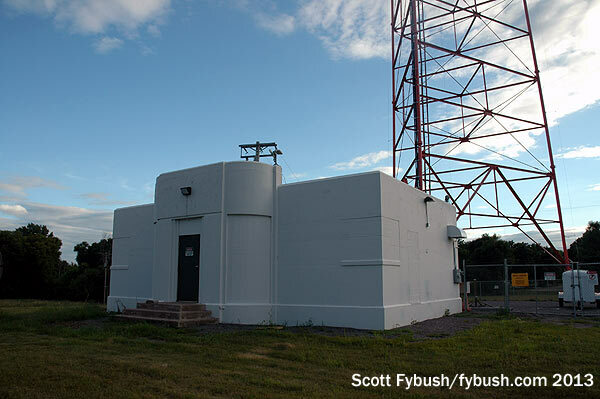 Cloud, and the KNSI/KCML site is just south of town with a venerable Art Deco building and a tall self-supporting tower. 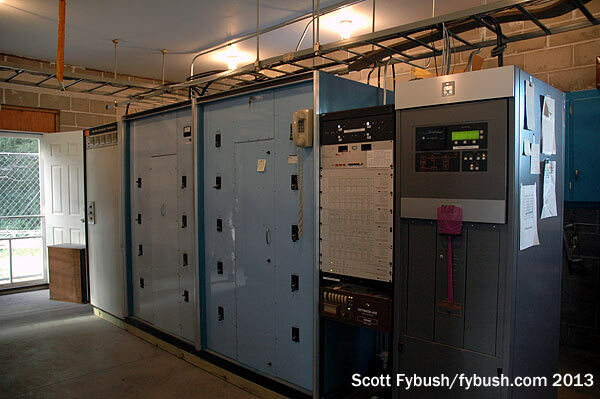 The inside of the building has largely been gutted, but you can still see where the walls around the old transmitters were; the current rigs for KNSI, KCML and KNSI’s FM translator, K277BS (103.3) now sit in what was presumably once a studio or office area. 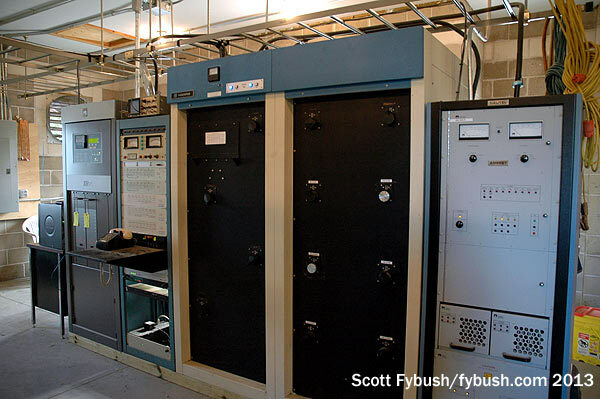 KNSI’s history, incidentally, goes all the way back to 1938, when this station was known as KFAM. With daylight waning, we race southward to catch another even more powerful new addition to the St. Cloud dial. 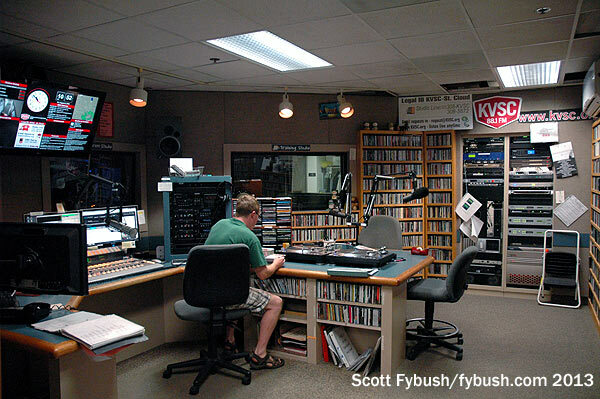 KYES (1180) is licensed to Rockville, 20 miles or so to the south, and it hit the airwaves in 2012 with Catholic programming. 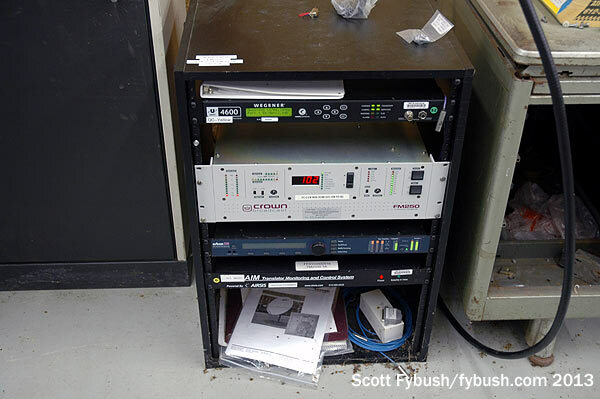 Its original licensee was the “Throw Fire Project,” and that’s fitting for a station that cranks out 50,000 watts during daylight hours, all of it aimed north at St. Cloud. 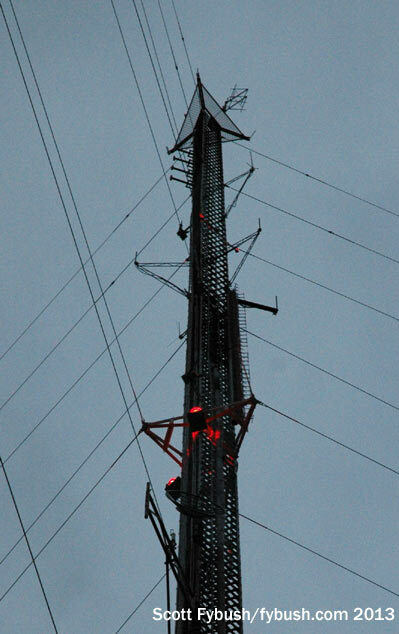 At night, KYES goes from two towers to all six and drops to 5,000 watts, still aimed north. 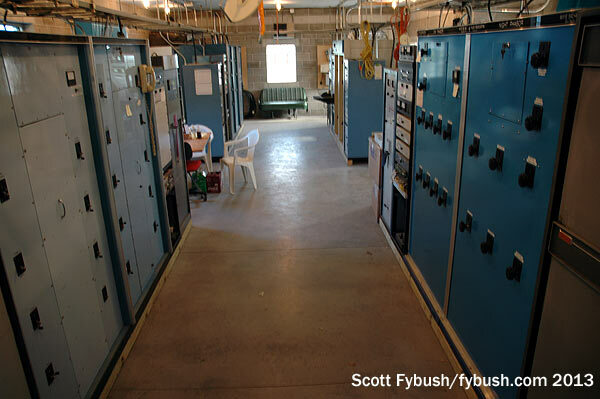 There’s a pretty sizable concrete block transmitter building out at this remote site, too, but there’s not much in it: the new Nautel transmitter is as compact as 50,000 watts gets, and it’s dwarfed by the phasor that keeps it company at one end of the room. Back into town we go, by way of Alex’s own pride and joy (and full-time employer). That’s St. 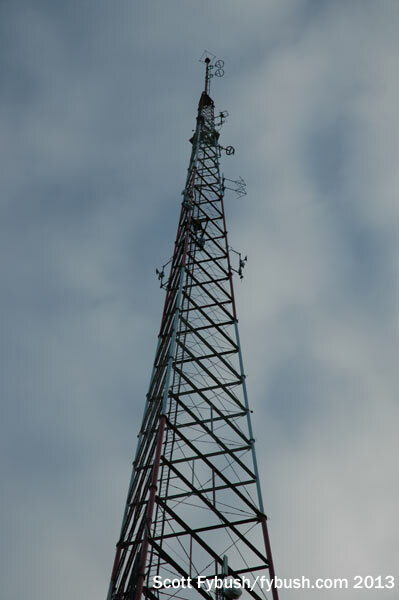 Cloud State University’s KVSC (88.1), and we find its tower sits south of St. Cloud near the I-94 interchange and the WHMH tower. 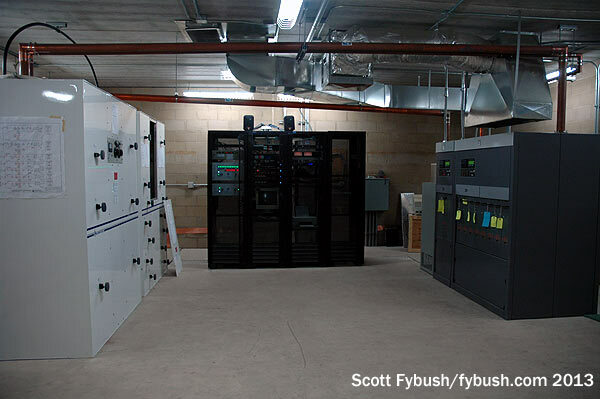 What you see here is a “before” picture: a few months afterward, Alex became the very first US engineer to install one of Nautel’s brand-new GV series transmitters in this room, which was also repainted in the colors of the university. 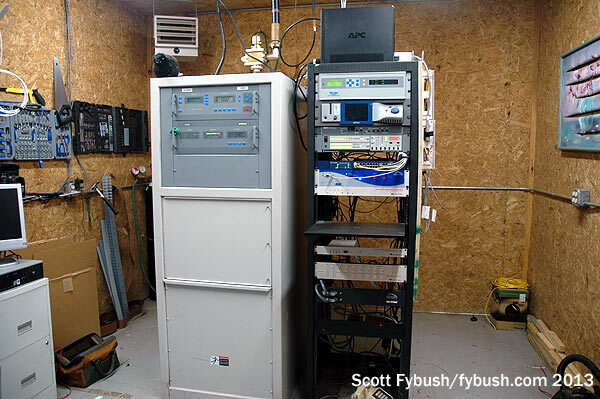 This leased transmitter site also houses plenty of two-way users, and since it’s been a while since we’ve showed you a translator, here’s a look at EMF Broadcasting’s K208DV (89.5), which operates from a little corner of Alex’s room here. 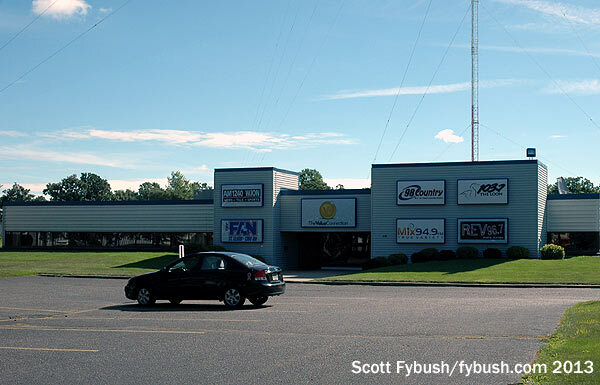 Townsquare Media owns the other sizable commercial cluster in town, which includes the second-oldest AM in St. 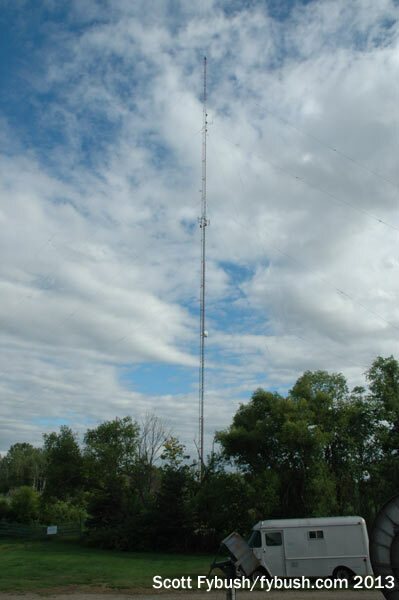 Cloud, WJON (1240), and it makes its studio home – and AM transmitter, too – just across the bridge from downtown St. Cloud. 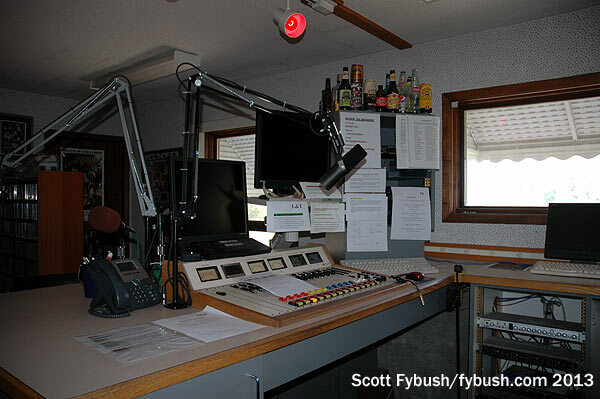 Townsquare’s FMs – big class C WWJO (98.1) and smaller sisters KMXK (94.9), KZRV (96.7) and KLZZ (103.7) – are all outside of town, and we don’t get to see them this trip. For a college station these days, KVSC is unusually ambitious, and Alex is rightfully proud to show off its studio complex on the university campus. 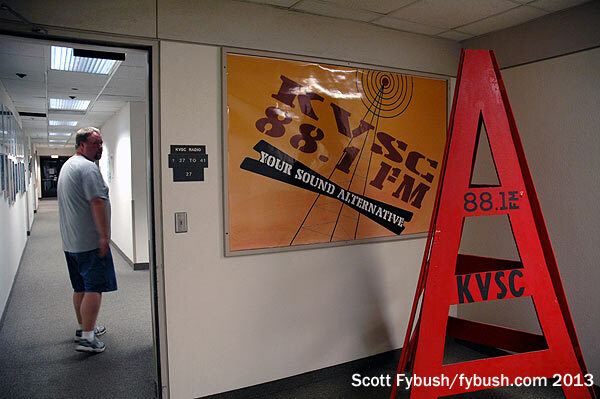 In 2013, the university was still building out a top-notch HDTV production facility here to do college sports and news, and KVSC itself is just down the hall behind a door marked with a nifty tower replica. 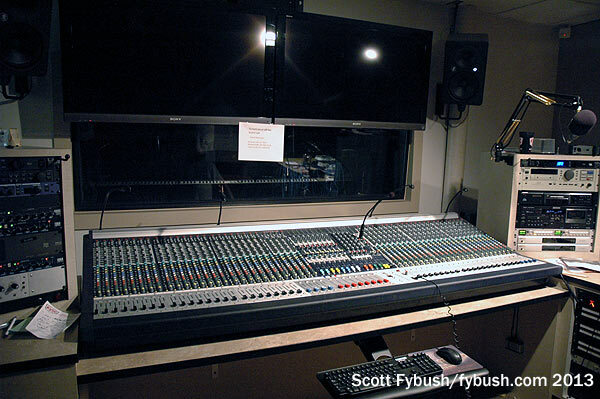 At the heart of KVSC is a complex of studios that includes a big on-air control room, a production room, a practice studio where students can learn how everything works before hitting the live airwaves, a news booth – and across the hall (adorned with many years’ worth of posters from the station’s big annual trivia fundraiser) there’s a live music production room complete with a spiffy HD monitor that descends from the ceiling. 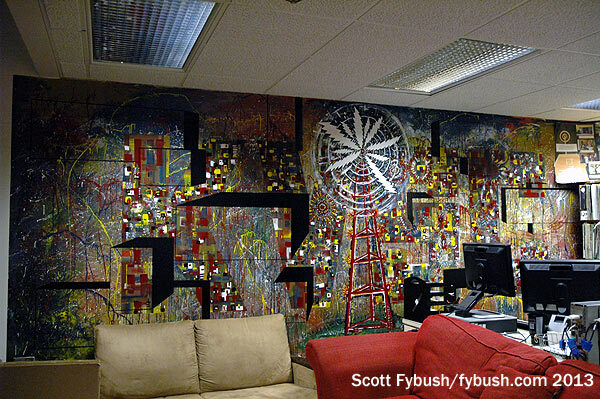 At the far end of KVSC’s studio space are staff offices and a lounge decorated with a trompe l’oeil 3D mural – and that, in turn, looks right out onto a terrace overlooking the Mississippi River. How cool is that? And that wraps up our long look at the upper Midwest from Big Trip 2013 – glad you could make it along for the ride! Big thanks to Alex Hartman for the tours! And don’t miss a big batch of St. Cloud IDs next week, over at our sister site, TopHour.com!